Stokes finished with 10 points (4-7 FG, 2-2 FT), 15 rebounds, one assist and one steal across 29 minutes during Friday's 85-77 loss to the Storm. Stokes' 15 boards marked a season high, and was two assists short of her career high. The performance also marked her fourth double-digit effort on the boards over the past five tilts. Stokes didn't attempt a field goal during Monday's loss against the Storm. In just under eight minutes of action, Stokes wasn't a factor at all during the loss Monday. She is so far posting just 2.3 points and 3.3 rebounds per game across 24 appearances this year. Stokes did not score but added two rebounds in the 80-77 road loss to Washington on Thursday. In just over six minutes, Stokes didn't attempt a field-goal but provided two rebounds in the loss. She is averaging 13.1 minutes over 10 games this year while adding 3.9 rebounds and 1.8 points per outing. Stokes (foot) is off the injury report for Wednesday's game against Las Vegas, Andrew Joe Potter of The Score reports. Stokes has missed the past four tilts while nursing a foot injury, but it appears as if she may make her re-appearance Wednesday. So far this season, she's averaged 2.7 points and 6.7 rebounds across 19.3 minutes. Stokes (foot) has been ruled out for Sunday's matchup with the Fever, freelance reporter Brian Heyman reports. Stokes continue to rehab back from a left foot injury, but won't be given medical clearance to return ahead of Sunday's contest. The Liberty then have off until Wednesday's tilt with the Aces, which should give Stokes another three days for added rest and recovery. Look for Kia Vaughn to see added run once again in the frontcourt with Stokes out Sunday. Stokes (foot) is out for Thursday's game against the Sun, High Post Hoops reports. Stokes was seen in a walking boot, so it seems possible she could be out for an extended period of time. Her next chance to take the floor arrives Sunday against Indiana. In her absence, Kia Vaughn will likely continue to see an expanded role. Stokes is a late scratch for Tuesday's tilt against the Mercury due to a foot injury. Kia Vaughn is drawing the start in her stead, Doug Feinberg of the Associated Press reports. The Liberty will look to find ways to replace Stokes' work on the boards, as she's averaging 6.7 rebounds across 19.3 minutes per game this season. It's unclear how serious her injury is. More word may arrive following Tuesday's game. Stokes' next opportunity to take the floor arrives Thursday against Connecticut. Stokes had two points (1-2 FG) and 12 rebounds during the Liberty's 87-81 win over the Fever on Saturday. Although only two points across 26 minutes, Stokes provided a season-high 12 rebounds, of which nine of them came defensively. The fourth-year center is currently averaging four more rebounds than one point scored with 6.7 rebounds and 2.7 points across three games played. Stokes signed an extension with the Liberty on Tuesday. 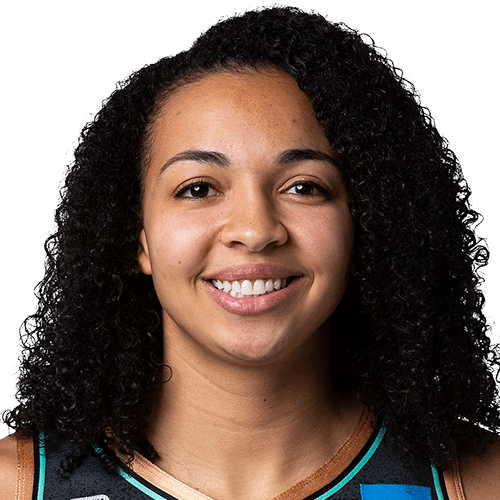 Stokes has seen her minutes decrease in each season since her rookie year, but she will still remain with the Liberty for the foreseeable future. Stokes will likely continue seeing limited opportunities in New York's frontcourt playing behind expected starter Kia Vaughn. Stokes supplied 10 points (4-7 FG, 2-2 FT), 10 rebounds, two assists and two steals across 20 minutes during Sunday's 92-62 blowout victory over the Sky. Stokes put together her fourth double-double of the year Sunday, taking advantage of the Sky's poor play. That said, she's still a fringe DFS option considering her season averages of 4.8 points, 6.4 rebounds and 1.0 block across 19.6 minutes per contest. CAREER TRANSACTIONS: Selected by the New York Liberty in the First Round of the 2015 WNBA Draft, 11th overall selection. 2017: Appeared in 34 games making 12 starts at center… Averaged 4.8 ppg, 6.3 rpg, and 1.2 bpg… Led the Liberty in blocked shots and ranked 2nd on the team in rebounding… Finished the season ranked 11th in the WNBA in blocks and 17th in rebounding… Collected 3 rebounds and 2 points against Washington in the WNBA Playoffs (9/10)…Knocked down 2 points and grabbed 7 rebounds. Also managed 2 assists, 2 blocks, and 1 steal at Dallas (9/3)…Went 3-4 from the floor to finish with 6 points in a win over San Antonio. Set a new season-high, and matched her career-high with 4 assists. Also matched season-high with 3 blocks (9/1)… Finished with her 4th double-double of the season scoring 10 points and pulling down 10 rebounds. Achieved a new season-high with 2 steals in win over Chicago (8/27)… Came off the bench to score 12 points, her 4th game in double figures of the season, going 5-6 from the field. Pulled down 4 rebounds against Indiana (8/8)…Managed 10 points and 16 rebounds, 1 short of her career-high, to post her 3rd double-double of the season in win at Chicago. Also had 3 blocks and 1 steal to tie both of her season-highs (7/30)… Scored 6 points, going 4-4 from the free-throw line. Pulled down double-digit rebounds with 10. Also had 2 blocks in win over Indiana (7/28)…In her 23 minutes of play posted a 17 +/- rating. Scored 4 points, collected 6 rebounds, and blocked two shots (7/19)…Posted double-digit rebounds with 10. Also scored 5 points and had 3 blocks against Washington (7/16)…Collected double digit rebounds for the first time since she recorded her career-high. Finished with 12 rebounds and 2 points in Phoenix (7/9)… Scored 4 points and grabbed 3 rebounds at Seattle (7/6)… In win over Seattle Storm scored 8 points and had 6 rebounds, also matched a season-high with 3 blocks (6/11)… Had a career-high 17 rebounds with 9 coming from the first quarter, and also finished with 7 points, 2 blocks, and 3 assists in a win over Atlanta (6/7)…Smashed her previous career-high, finishing with 23 points in a win over the Mercury; shot 11-of-12 from the free-throw line, also had 14 rebounds, 1 shy of her career-high, and 2 blocks (6/4)…Finished with a new career-high of 15 rebounds, with 7 on the offensive glass, and also tied career high of 13 points shooting 6-of-8 from the field in win against Dallas (6/2) … Had 2 rebounds, 1 assist , and a blocked shot against the Sparks (5/30) …Pulled down season-high 8 rebounds, swatted away 3 shots, and scored 2 points against Seattle (5/26) …Grabbed 7 rebounds, 3 points, and 2 assists in first road game against Phoenix (5/23) …Posted 6 points and 3 rebounds in game versus Minnesota (5/18) …In season opening win over the Stars collected 4 rebounds, 2 assists, and 2 points (5/13). 2016: Appeared in 27 games, averaging 6.9 points and 7.4 rebounds per game… Missed the final 7 games of the regular season with a hip injury… Finished the season ranked 6th in the WNBA in blocks (1.4 bpg) and 7th in rebounding (7.4 rpg)… Had 5 games scoring in double figures and 6 games with double digit rebounds… Led the Liberty with a .641 field goal percentage and 38 blocked shots… Returned from injury for the 2nd Round of the WNBA playoffs, finishing with 4 points and 2 rebounds in 10 minutes against Phoenix (9/24)… Filled up the statsheet once again as she finished with 6 points, 7 rebounds and 2 blocks in New York’s win over Atlanta (7/13)… Finished with 9 points, 11 rebounds, 2 steals, and a block in 33 minutes of action in New York’s overtime win at Minnesota (6/29)… Was a perfect 4-for-4 from the field scoring 9 points, grabbing 8 rebounds, and blocking 1 shot in New York’s overtime loss to Phoenix (6/26)… Put up a season-high 12 points to go along with 7 boards and 2 blocks in New York’s 80-79 win over Chicago (6/24)… Nearly posted a double-double, with 11 points and 9 rebounds, to go along with 2 blocks, in the Liberty’s double-overtime win at Atlanta (6/22)… Scored 8 points, hauled in a career-high 14 rebounds, dished out 2 assists, had 2 blocks and 1 steal in New York’s overtime win at Indiana (6/19)… Had 10 points, 9 rebounds, 2 blocks and a steal in 27 minutes in New York’s win at Connecticut (6/16)… Scored 7 points, grabbed 7 rebounds, and blocked 4 shots in 23 minutes of action vs. Dallas (6/14)… Scored a season-high 11 points in New York’s contest at Los Angeles (6/7)… Blocked three shots, including a highlight rejection of Breanna Stewart that was No. 3 on the SportsCenter Top-10 Plays of the day, while grabbing 7 boards and scoring 7 points in the Liberty’s win at Seattle (6/5)… Scored 8 points, blocked 3 shots, and grabbed a career-high 12 rebounds in a win over Indiana (6/3)… Finished with 5 points, 7 rebounds, 2 blocks, 2 steals, and 2 assists against Atlanta (5/24)… Gathered in 10 rebounds along with 4 blocks and 6 points in the Liberty’s game vs. LA (5/21)… Corralled 7 rebounds and scored 5 points in a win over Dallas in the 2016 home opener (5/15)… Scored 6 points with a game-high 3 blocked shots in win over Washington (5/14). 2015: Named to the 2015 WNBA All-Rookie Team, finishing second with nine votes… Earned 2015 WNBA All-Defensive Second Team accolades… Named the WNBA Rookie of the Month for August on Sept. 1… Appeared in 34 games and started 6 times… Averaged 5.8 points, 6.4 rebounds, 1.9 blocks and 25.4 minutes per game… Led the Liberty in blocked shots 27 times, rebounding 13 times, and posted 3 double-doubles; only rookie to post a double-double in 2015…Ranked fourth in the WNBA in blocks, 11th in rebounds and 35th in minutes… Led all rookies in rebounding and blocked shots… Set a new franchise record with 67 blocked shots… Playoff averages of 6.7 points, 8.2 rebounds, and 1.3 blocks per game… Notched first-career double-double with 11 points and 10 rebounds, also dishing out season-best 4 assists with 2 blocked shots in a win at Chicago (6/30)… One of the most impressive stat lines of the season, blocking a Liberty franchise record 8 shots to go along with 7 points and 8 rebounds in a win over Connecticut (7/16)… Strong all-around performance with 9 points and 9 rebounds, blocking 3 shots with 2 steals in a season high 33 minutes in a win at Los Angeles (7/22)…Career-high 13 points (6-8 FG) with 11 rebounds for second-career double-double in a home win over Chicago (8/11)… Led all players with 13 rebounds, scoring 8 points with 2 blocks in 30 minutes off the bench in a closeout win over Washington in the Eastern Conference Semifinals (9/22)… Nearly perfect in leading all scorers with a career-best 21 points on 9-of-11 shooting with 3 blocks and 5 rebounds in a win over Indiana in game one of the Eastern Conference Finals (9/23). PRO OVERSEAS: Played for the Samsung Blue Minx in South Korea in 2015-16… Played for Besiktas in the Turkish League in 2016-17… Returned to Turkey to play for Botas during the 2017-18 season. INTERNATIONAL: Played for the USA Basketball U16 National Team and won a gold medal at the FIBA Americas U16 Championship in Mexico City in 2009. COLLEGE: A three-time national champion, Stokes concluded her senior season after one of the nation’s finest defensive campaigns… The 2014-15 American Athletic Conference Defensive Player of the Year, Stokes set a new school single-season block record when she rejected 147 shots… Finished her career at No. 3 in Husky history with 325 blocks…. Additionally, the center ranked second on the team with 265 rebounds, averaging 6.8 boards in just 18.3 minutes as a senior, which ranked 13th in the conference. Her 278 rebounds in 2013-14 were the sixth-most ever pulled down by a UConn junior while her 89 rejections was the third-highest total by a Husky junior … A member of the 2011-12 Big East All-Freshman Team… Stokes shot over 57.0 percent from the field in each of her four seasons, highlighted by a career-best .660 field goal percentage in the 2012-13 season… Posted collegiate career averages of 4.5 points, 6.8 rebounds, and 3.9 blocks per game. PERSONAL: Born on March 30, 1993 … Mother Julie Saddler and father Greg Stokes … Father was an All-American basketball player at the University of Iowa, played for the Philadelphia 76ers and won gold with the 1983 USA Pan American Games Team… Psychology major … Averaged 25.0 points, 14.8 rebounds and 5.1 blocks per game in her final year at Linn-Mar High School … Named to the 2010 United State Women’s Youth Olympic Games Team.